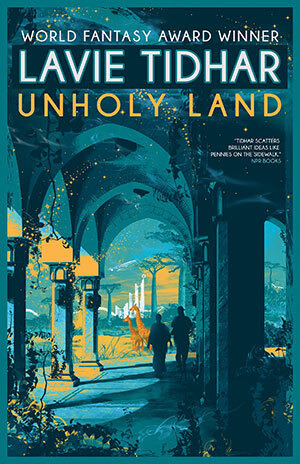 In the beginning of Lavie Tidhar's new novel Unholy Land, it seems like the book is based on one big politicohistorical What If: What if the Jewish state of Israel (which is called Palestina in the novel) was established in Eastern Africa instead of Middle East? What if the displaced people who had to make room for the new state were the inhabitants of a strip of land between Kenya and Uganda instead of Palestinians? What if there were illegal Jewish settlements beyond the Green Line and "a separation wall" being built on the disputed territories of Nakuru instead of West Bank? This poor man's promised land, featuring human rights abuses, ethnic tensions, civil unrest and suicide bombings, is not all there is to the novel, however. The book begins with Lior Tirosh, a troubled novelist, returning to Palestina, catching up with old acquintances, getting worried about a relative of his, and running into trouble with the state's brutal security operatives. Then the whole tale becomes something else: it's not a politically charged alternative historical thriller but something much more fantastic. I was first a little taken aback by the inclusion of Kabbalistic slash quantum mechanical explorations of parallel realities very reminiscent of Miéville's The City & The City, but when you get your mind around it, the metaphorics do work. Unholy Land discusses Israel, and in everything related to Israel, people live in different political universes. They look at the same thing but see completely different realities, as if there were different worlds on top of each other, not completely aligning. In Unholy Land, the borders between realities are porous, but once you get settled to one of them, its logic takes hold and its harder to see things in any other way. I feel there's a profound point that the novel is trying to make here, although occasionally it tries quite hard. The execution is a bit tangled in places, but Tidhar manages to keep the narratives of the third-person Tirosh, a first-person security spook Bloom and a second-person reality-hopping literary scholar and some sort of a (non-literary) agent Nur under control. Especially the latter two narratives deliver some very quirky and enjoyable prose. Some chapters describing Tirosh's dealings with different characters feel a bit contrived here and there. Certain characters he meets seem little more than mouthpieces for different ideas and worldviews which Tidhar wishes to discuss, not real people with real personalities, and that's a bit disappointing. In one of the more heavy-handed instances, Bloom even invokes some Nuremberg logic when defending to himself and to the reader the horrible things he must do: "I was merely doing my job!" Not very subtle, eh? In the novel, there are so many comments made about how the persecuted have themselves become persecutors that Tidhar really doesn't leave the reader uncertain of how he feels about the current situation in Israel. However, despite a couple of unplausible-sounding exchanges, Unholy Land still manages to hold my interest quite well. I especially enjoyed the poignancy of its worldbuilding and the inventiveness of the narrative levels – fans of more straight-faced fantasy are probably not going to enjoy it as much. Tidhar throws in a heavy dose of metafictionality into the mix as well, mentioning several of his own previous novels as works by an alternative-dimension Lior Tirosh. Depending on whether you are into that sort of thing, maybe you ought to give Unholy Land a go. There's quite much going on at times and Tidhar struggles to keep all the balls simultaneously in the air, but it is an engaging book with something worthwhile to say.